You might have faced this, specially in you homelab env ;) , where after a long time when you tried to login on to vCenter SSO and couldn't recall the SSO administrator account "administrator@vsphere.local" password. Here the good things is, the process of resting SSO administrator account password is pretty state forward, and we can easily reset the "administrator@vsphere.local" password. Log in to vCenter Server with a domain administrator account. If the Platform Services Controller is installed separate from vCenter Server, log in to the Platform Services Controller server. When prompted for the Account UPN, enter: administrator@vSphere_Domain_Name.localBy default, this is: administrator@vSphere.localA new password is generated. If you customized your vSphere Domain name, provide the customized domain name. If the prededing steps fail with a domain administrator account, use a local administrator account. 6. Use the generated password to log in to the administrator@vSphere.local account. 7. 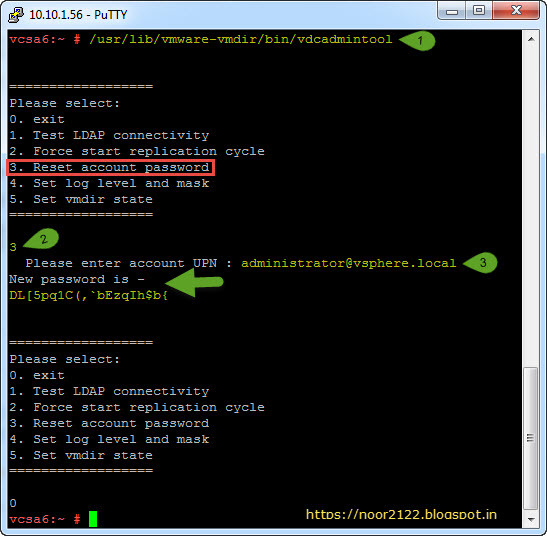 After the password is regenerated, log in to vSphere Web Client and change the password. Log in to vCenter Server Appliance using SSH as the root user. 5. Press 3 to enter the Reset account password option. Once you press enter, a new password is generated. 7. Use the generated password to log in to the administrator@vSphere.local account. 8. Once you log in to the vSphere Web Client, change the password.